It may surprise you to learn that many economists and politicians believe we should eliminate the penny and nickel from our currency. If you’re like me, you probably have fond memories tied to our smallest denominations. As a kid, I remember buying penny candy from my neighborhood Magic Mart. I appreciated the efficiency of the one for one exchange. I remember finding a “Wheatie Penny” the day my daughter was born and saving it for the “penny in her shoe” part on her wedding day. But is nostalgia enough to keep the penny and the nickel in circulation? 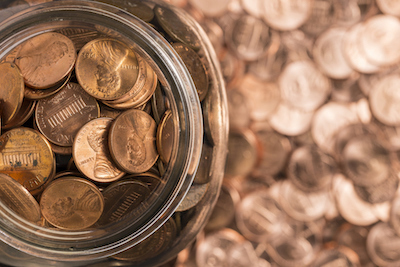 In this era of mobile payments, online shopping and a credit card in just about everyone’s wallet, do we even need pennies and nickels? It’s hard to find a gum ball dispenser that accepts anything less than a quarter. A nickel gets me only three minutes in my town’s parking meters. And, you might not know this, but small coins cost more to produce than they’re worth: A penny costs the U.S. Mint 1.8 cents to make; each new nickel, 6.6 cents. Let’s simplify transactions. Retailers could round their pricing to one decimal place rather than two, the Journal notes. Already businesses are doing this today. No harm would come. Other countries have dropped small coins from circulation and “suffered no adverse consequences,” the Journal says. Canada stopped minting pennies in 2012. New Zealand bailed on its one-cent and two-cent coins in 1990 and its five-cent coin in 2006. No noticeable harm has occurred in those two countries, the Journal reports. Pennies and nickels are in high demand. The U.S. Mint has doubled its shipments of one cent and five cent coins in the past decade, the Journal reports. The U.S. Mint is profitable. The fact that small coins cost more to produce than they’re worth isn’t a problem when the producer makes money overall. The journal reports that the U.S. Mint grosses 45 cents for every $1 in currency it produces. That’s an outstanding margin for any business operation, most of which produce what they call “loss leaders” — output designed to boost overall sales and broaden product-line use. “[Pennies and nickels] help create demand for more profitable coins in the cash economy,” the Journal says. They maintain confidence in U.S. currency. The penny and nickel function as “lubricant that greases the wheels of commerce,” the Journal says. Some businesses need them. Others don’t — such as food trucks, which use flat pricing to speed up checking out. Having pennies and pickles in circulations just give businesses more options — and maintains a positive image of U.S. currency on global markets. On the one hand, some view pennies and nickels as a nuisance. Their elimination would have no effect on commerce. On the other hand, pennies and nickels are popular coins. Keeping them in circulation gives retailers, restaurants and other businesses more options in pricing their services. ← Why has the stock market become so volatile?